We’ll help you improve the success of your website! 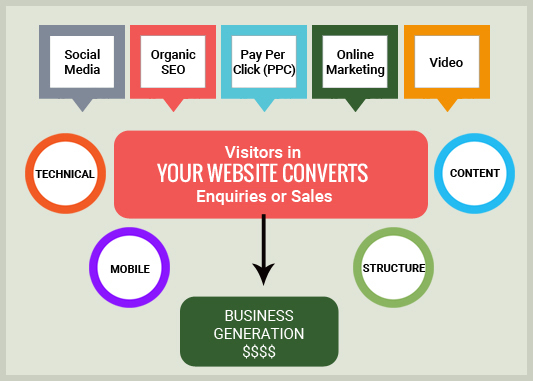 We at Webstrategies provide website optimisation services that will help increase your website’s success (i.e. Generate more business). Our approach is sales-focused – The number one reason for having a website for your business is to increase sales. So, naturally, we put a lot of emphasis on the quality and quantity of the leads and sales generated by your site. We, therefore, ensure that all our activities contribute to this bottom line. Your success is our number one priority – We strive to ensure that you get a positive return on investment (ROI) when you use our services. We continuously measure and report performance – We track visitor activity starting from source through to action (e.g. leads or sales), and report the findings to you in a clear and easy to understand way. To achieve success for your site, we first study your business, its target market, as well as its competition. From the information we gather, we create a strategic plan customised for your website that will help increase the business you generate from it in a way you can measure. "Ashley from Website Strategies did an awesome job in bringing my website queenslandmotorcycleschool.com.au up the Google ladder. I had no idea that Google was so complicated in the way it did its searches, but Ashley made it all so clear and simple even to someone like myself with very little computer experience. Thank you!"